Robby has 2 self customized belt and pulley drive cutting lathes with Presto mechanics and Technics modified motors with Neumann stereo cutterheads SX74, SX68 , SX15 helium cooled and 2 old mono head Presto 1-D studdyed for the mono cutting amplifier A93 all tube (807). 2 mono cutting amplifies vacuum tube with 6x EL34 Mullard tubes. Double Stereo cutting amplifier bridged with vacuum tube with 4x KT88 tubes each.. it gives more than 200+200 W in bridged mode. The modified SX74 is his death in the main cutting lathe. Presto A93 mono amplifier with 2 triodes A807. UREI6500 amplifier, solid state high power, which has quick power peak transients... about 400+400 W RMS. 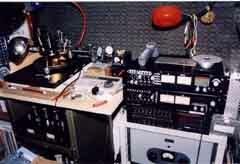 Solid state old Outline 10 bands analyzer. 4x Neumann Feedback preamplifiers with Neumann elliptical equalizer and custom-made reference RIAA with original TELEFUNKEN tubes and PASSIVE eq. Rega Planar 3/RB300 Reference turntable with Stanton CollectorÂ’s100 reference cartridge. Various reference cartridges to do comparison tests with the cuttings made: Stanton 681EEE/S Â– 680EE/S Â– 680EE Â– 680 EL II. Pickering XSV4000SP. 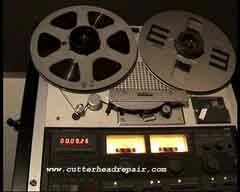 Shure V15III He Â– V15IV MR.
4 tracks 1/4" REEL tape recorder TEAC 3440 with DBX unit. Panasonic SV3900 , Sony DTC690, Sony 57ES DAT players. NAD 502 CD player with Audiotechnica plate stabilizer. Harman-Kardon TD202 cassette player with Otari NAB passive eq..
DBX DDP 24bit, Behringer 9024 24 bit multi-band processors/delays/converters. DBX 166A mono-band analog compressor. Self-made line preamplifiers with ECC series triode tubes. Neumann U87Ai, AKG C568B, C4000, C1000 and 50'ies "RIEL" TAPE diaphragm microphones for studio recordings. We can make audio restoration service and live recordings thanks to qualified audio engineers equipped with Shoeps, Neumann, Sennheiser, Akg microphones/digital mixer/HD recorders... ask us for more infos! Infinity Studio, AR monitor loudspeakers with Hexfet amplifiers like cutting room monitors, but... we can make references also with Meyer-HD1 and Genelec studio ref. loudspeakers.